Listed at 194,750 € including agency commission paid by buyer 4750€ or (145,000€ if just interested in the house). Nothing to do, just bring your suitcases this is a move in condition home. This Immaculate, 2 bedroomed home with additional bedroom/office space with bathroom on third floor, comes with a separate 1 bedroom Gite. Shows pride of ownership, renovated to a very high standard and sits on 2741 m2 of land. Located in a small hamlet, just outside the village of Plougonver, with a bakers, bar and post office and within 7 km of the pretty town of Belle-Isle-en Terre that has all your daily amenities. The larger town of Guingamp is at approximately 32km with the bigger shopping centres and TGV train station (Paris 3.5h). There is easy access to the ferry ports of Roscoff – 66km and Saint Malo – 151km. The airports of Brest – 88km and Dinard – 137km are also easily accessible. Access to the various beaches of Brittany are within 30 minutes where you can explore the fantastic coastline. This bright and airy house consists of large veranda located off the kitchen with built-in storage, giving you unobstructed views of the gardens. A fully fitted kitchen with a wood burner. Cosy living room with Godin wood burner. Side entrance with porch on to a gravelled courtyard with love seat. Convenient downstairs WC and large hallway with storage under stairs. On first floor there are 2 double bedrooms and a large family bathroom. On the 2nd floor there is a large space that is currently used as an office/bedroom perfect for guests along with shower room, along with abundance of built-in storage, as well as an additional storage room. 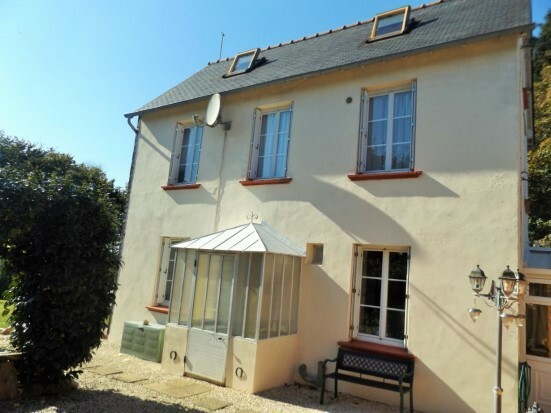 The gîte is also renovated to high standards, with a separate courtyard. Consists of fully fitted kitchen, large living room with featured fireplace with wood burner. Downstairs bathroom. On the first floor there is a good size bedroom with additional space to add an upstairs bathroom if wanted over the kitchen, currently accessed via kitchen. The property has been fully insulated, and benefits from double glazing, a newer fosse and high speed internet. There is also a separate garage and parking to the front of the property as well as parking by house. There are 5 storage sheds one with electricity and a large polytunnel. Glazed Windows, Tiled flooring, Glass door to courtyard entrance to hallway, and two wooden benches/shelving. Tiled flooring, Wood panelling with shelving, storage cupboard under stairs, solid wooden staircase to first floor, entrances to living room and kitchen and entry room. Fully fitted kitchen, with featured wood burner with tiled surround and shelve mantle, double gas oven, tiled surround, exposed beams and wood panelling. Electric heater. PVC window/door to Veranda with electric shutter. Window to courtyard. PVC construction with double glazed windows, tiled flooring, French style doors to garden, fitted with cabinets and counter top. Electric heater. Wood flooring, windows to side and front, wood panelled with featured wood shelving. Electric heater. Wood flooring, windows to side, wood panelled. Electric heater. Large family bathroom, dual sinks, bath/shower combo, tiled flooring, window to front, electric heater. Fully fitted out and great use of eves with storage, wood flooring, Velux window, and window to side. Access for the plumbing in bathroom. Wood flooring. Fully fitted kitchen, with tiled flooring exposed stone walls, exposed wood ceiling. Electric heater. PVC front door. Fixed stairs to currently storage room with wood flooring and Velux window, possibilities of en-suite bathroom. Archway to living room. Windows to front and rear along with door to enclosed patio with solid fenced surround and rear access to house. Tiled flooring, features brick fireplace with wood burner. Door to bathroom and stairs to first floor. Electric heater. Exposed beams and painted stone walls. Shower, WC and Sink, tiled flooring, painted stone walls. Wood flooring, Velux windows, exposed a frame beams and wood panelled featured wall.